An easy day today, I just have to ride 45km to the north of this island in Lake Baikal, and back to my hotel tonight. The first 20km are on easy trails, so I set the Multistrada on enduro mode and at 45mph I feel like the king of the world. 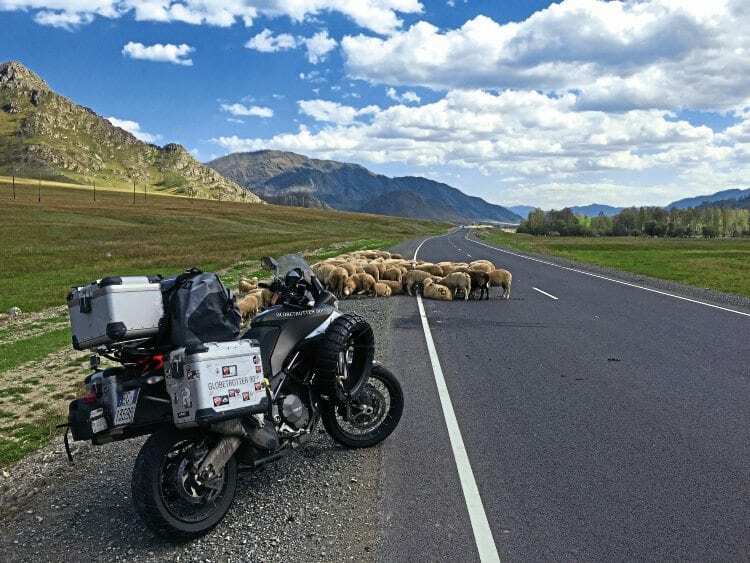 Laurent Cochet was one of seven riders chosen to ride the Multistrada around the world. I come to a barrier with guards who take 240 roubles for me to continue (about £3) to a crossing. Right trail or left? Both are really bad, with some big ruts, mud and sand. Let’s take the left one and… I crash, my right foot trapped under the pannier, and there’s nobody coming. I breathe deeply, remove my helmet and my gloves. I try to remove some sand from under my boot, but it just sinks deeper, as does the bike. Then I manage to put my video tripod under the pannier to support it, remove more sand and yes, it works! I won’t have to cut my leg off like in the movies after all. It takes me two hours to reach the north of the island, but it’s really worth it. It is splendid here, with huge cliffs going deep into the lake. Bikal is the largest freshwater lake by volume in the world, containing roughly 20% of the world’s unfrozen surface fresh water. I explore the island, and don’t feel like riding those trails back again, but somehow it’s easy this time, and I’m back at the hotel by 7pm. I feel like I’m surrounded by Dinky Toys, as all the cars and trucks are so old. I find it cool and kind of vintage, but I’m pretty sure the Russians don’t. Their vehicles break down often and the majority can’t afford to buy modern cars, especially since the 2014 embargo. Prices are soaring, the rouble is devalued. Sometimes, I feel like I’m crossing this country really too fast. I try my best but I really feel that I don’t take time enough to understand Russian people! Wherever you are in the world, sheep feature. However, I feel good this morning. 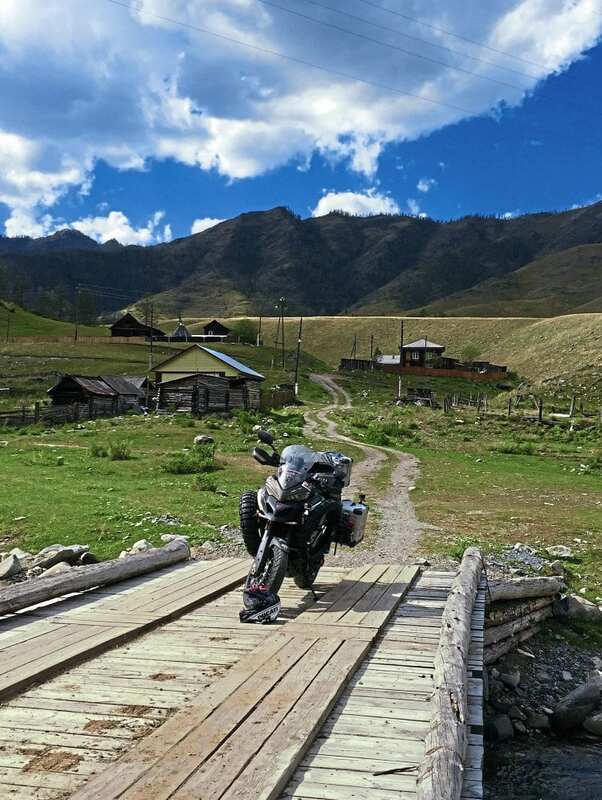 Baikal Lake has really revitalised me, showing me a piece of paradise, and the Multistrada is running well. It has 16,000km showing so far and I’ve ridden more than 7000 of them. All I do is put grease on the chain and fuel in the tank. But it’s dirty – rain, roadworks, mud everywhere – and after removing the panniers each night my hands are black. I always have a shower wearing my riding gear, which is dry in the morning, but inside it still stinks. 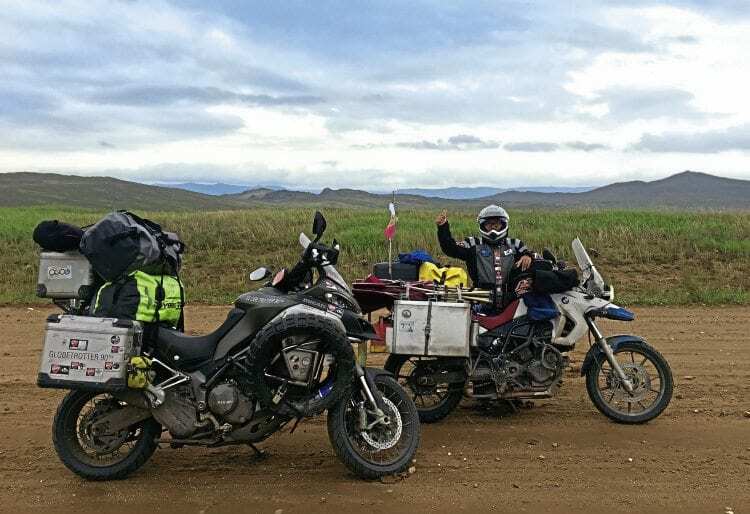 Tomorrow, I go to Ulan-Ude – I hope to see some of the finishers of the London to Ulan-Ude Rally. They started in July with second-hand cars costing less than 1000 euros and engines under 1.2 litres. I love the spirit of that. The cops arrest me as I ride out of Chita, just out of curiosity. There are two of them, one little, one tall and thin. The little one tries to be very serious at the beginning, but the tall simpleton behind him keeps bursting out laughing. They want to talk about Francois Hollande, the Eiffel Tower, and see a picture of my house. I divert the conversation, telling them that they really have a beautiful country with nice people (which is true) but that I have a lot of miles to do today. The small cop tries to be serious and tells me that I should be very careful because recently a Japanese tourist like me had been shot on this road, so I should ride straight to Vladivostok, 3000km away, without stopping. That does worry me a bit. Spaced out village in the wide open spaces of Russia. After 100 miles I have to stop for fuel, and meet a nice guy who welcomes me and doesn’t want to talk about Hollande or Gerard Depardieu, which I’m very happy about. He tells me about a recently-discovered Siberian village where they had never heard of the Second World War – whether this is truth or urban legend, some people in Moscow believe it. Today, my new experience is Aleksander. I wake up determined to cover my daily 500 miles in just a few hours, but right from the start, I feel my eyelids growing heavy. I manage to cover just over 100 miles like this, but finally give up, find a small trail close to the road and stop to sleep. But when I try to nod off, my subconscious, which on the bike has been trying to send me to sleep, now keeps me awake. ‘You can’t sleep, because you are afraid.’ Bloody subconscious. I can hear noise everywhere in the forest, and I start to think about the story of the Japanese tourist who was shot. I get back on the Multistrada and head off. New-looking church, complete with onion domes and white picket fence. Ten minutes later, my eyelids are drooping again but this time I find a filling station and lay down in the grass to sleep, huddled up to my camera bag. I am awoken by Aleksander, who is riding an old Suzuki 800 Intruder. According to Aleksander, his suspension is ‘kaput’ and a lot of other things are ‘kaput’ as well. He has no rain suit, no real equipment, a pair of SuperTrapp exhausts (very important), and plastic bags to protect his clothes. He really looks like Denis Hopper in Easy Rider and doesn’t seem to care about rain, cold, death or other people’s opinions. Above all, he wants to ride, meet, exchange and discover. 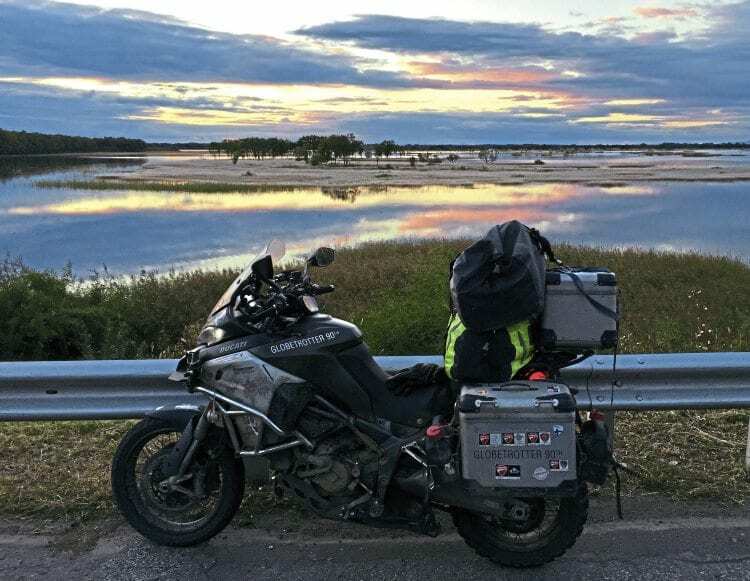 I thought I was having an incredible adventure riding from Moscow to Vladivostok on the Multistrada, but Aleksander is doing the same on an old chopper. Laurent (left) and friendly local. 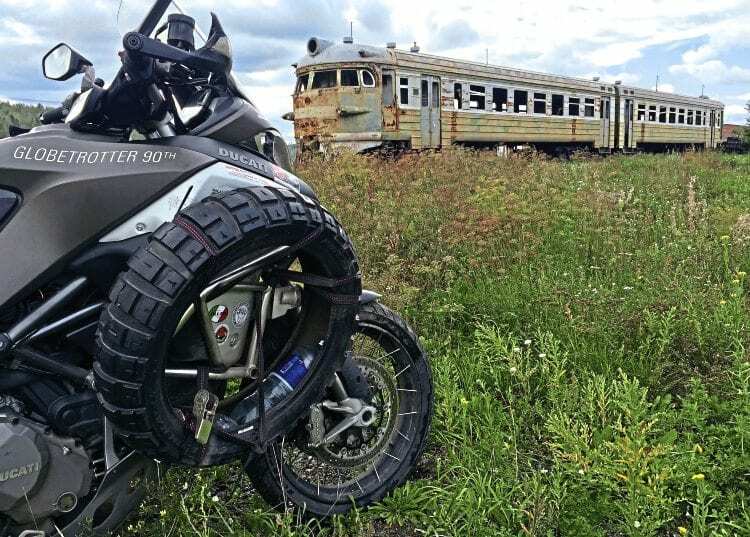 At Blagoveshchensk near the Chinese border I refuel and stop to have my rear tyre changed. Aleksander (a different one) immediately slips on his overalls, removes the rear wheel and hands it over to a mute guy, who does the tyre changing. When it’s all done I ask how much. Aleksander puts his hand over his heart and just asks me to sign the old tyre with my nickname ‘Lolo’. It turns out he knows me through my videos on YouTube. I am stunned, and give him my spare front tyre as a gift. 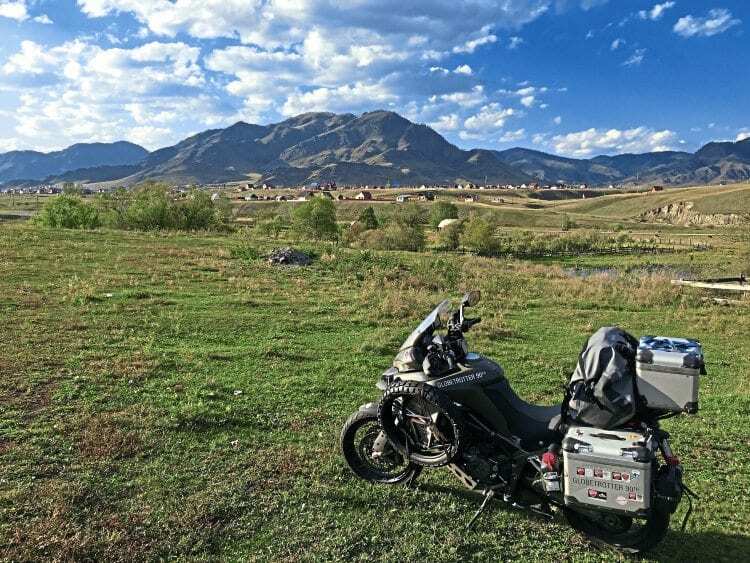 Fellow overlander on an F700GS made sure to bring his deckchair, strapped to the pannier. The bike feels much better without the spare tyres strapped on. Since I have changed the rear tyre and removed the spares attached on both sides of the bike, it is really agile, easy and precise. I shift down and twist the grip. This bike is just amazing. It has the torque and power of a four-engined bomber together with the agility of a Spitfire. It feels as if I’m riding a giant supermoto. Let me tell you about my typical daily schedule, starting in the evening. I check into a hotel and immediately have a shower. Then I put the camera batteries on charge, save all shots of the day onto an external disc, have dinner and go to bed. About 3am I have to wake up to swap the charging batteries over. Then the second waking, the one I really hate, around 6am. I eventually leave at around 8am because it really takes time to attach your bags, protect the computer from the bumpy roads, fix the GoPros, the GPS, etc. Now there’s an evocative barn find. 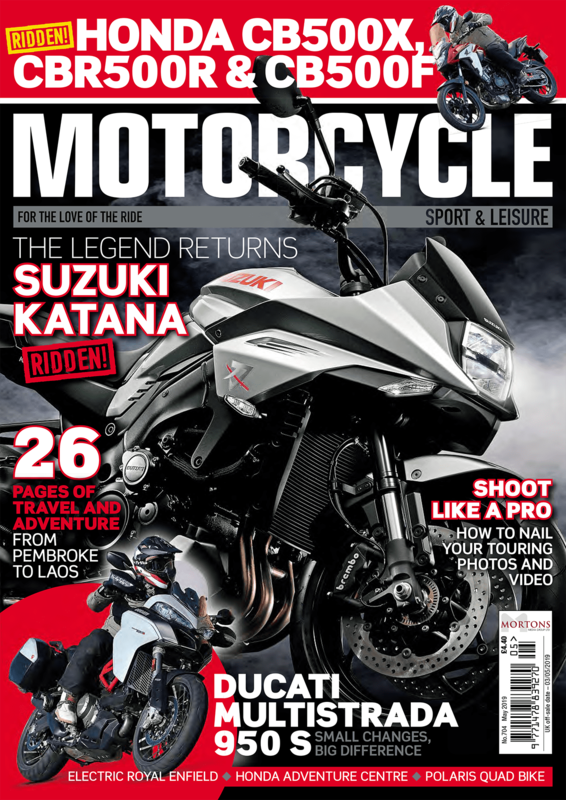 The Multistrada handled better once the spare tyres were used. The, I ride between 300 and 600 miles a day. I don’t have lunch – no time for it – just some crisps and a coke, to avoid those moments when my stomach says: ‘What are you doing? This is not a Gulag.’ Time spent on pictures, videos and drone shots mean long days and sometimes I only get four hours’ sleep. 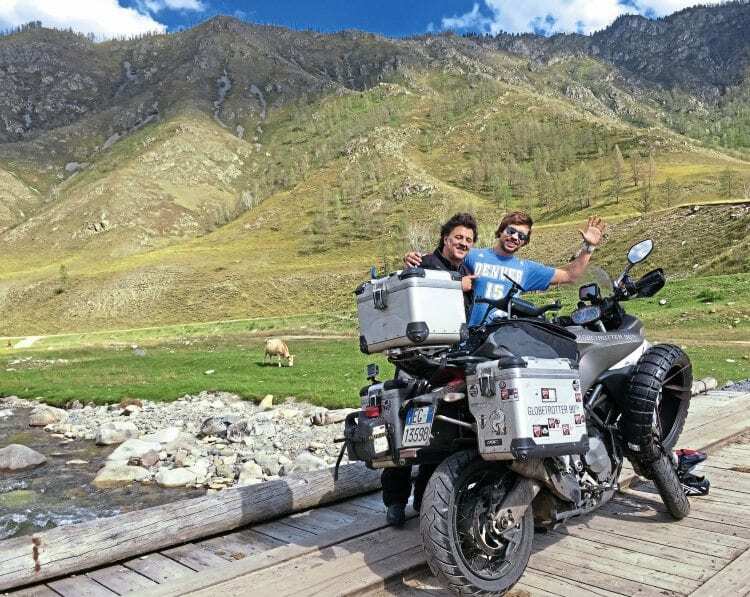 I love this Globetrotters adventure, but I’m French and I have to complain… Anyway, I save a lot of time after I lose my drone. Attempting to film myself crossing a bridge over a swamp, I press the wrong button and the drone dives deep into the water. Terrible, but with no drone video to organise I will save two hours a day. Today, far away I see a scooter coming towards me. 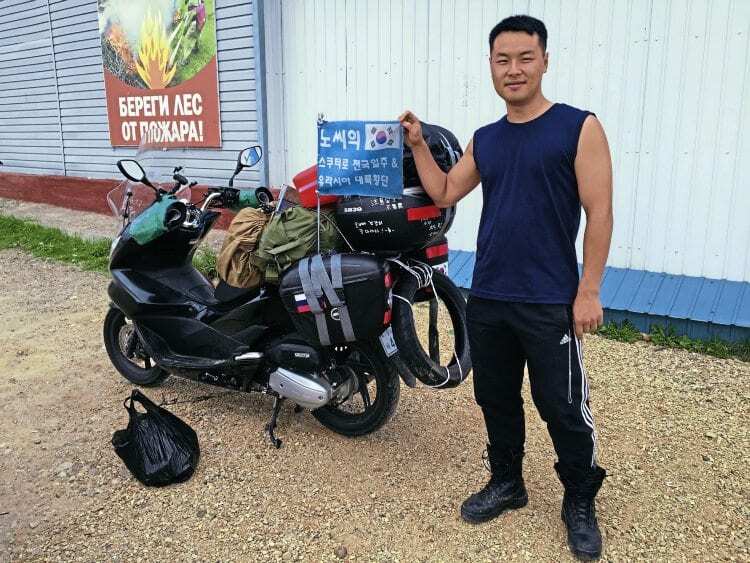 It was Noh Hyo-Seok from South Korea, riding to Valencia on the trans-Siberian road on his Honda PCX125. He uses one litre of fuel every 40km (about 110mpg), has a maximum speed of 56mph and rides 250 miles a day. He already looks exhausted. A friend of his tried to make the same journey on a smaller scooter, a Super Cub, but he got robbed by some mushroom dealers on the road. Korean friends sent him some money to be able to fly home. It’s the last stage of my trip; Khabarovsk to Vladivostok. I am both happy to finish and already feel nostalgic for the ride. 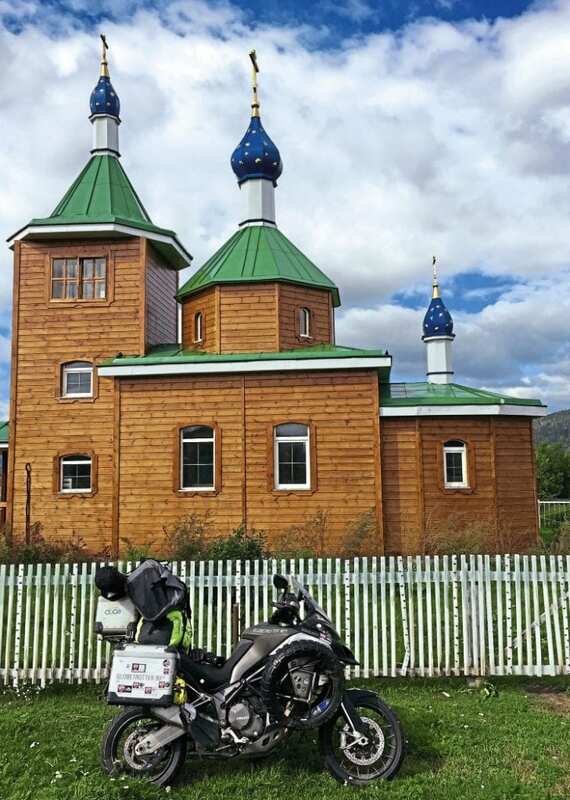 This guy was crossing Siberia on a Honda PCX scooter. I will miss everything here in Russia. The fabulous people, the holes in the Tarmac; the long straights across Siberia; the landscapes, sometimes monotonous, sometimes incredible. Oh, and the way people drive. 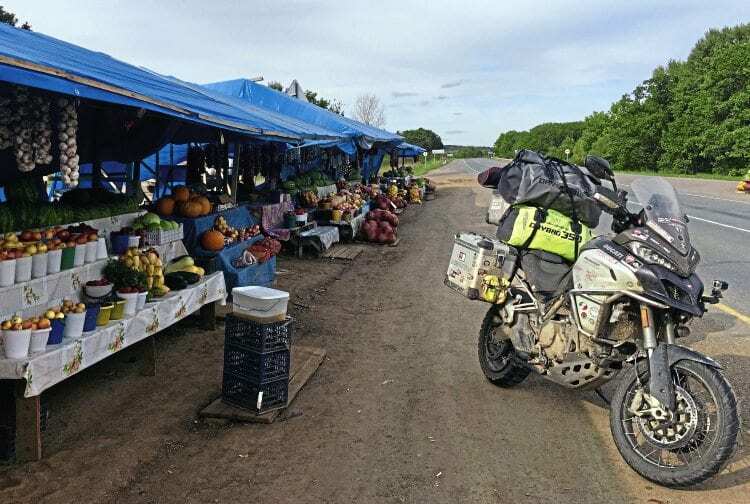 Roadside stalls sold all the fruit and veg you could possibly want. At Vladivostok, there is a light drizzle, some fog. At the hotel, I remove my bags and give a huge kiss to the Multistrada. This does not make me Valentino Rossi, I did not win anything but the Multistrada and I trusted each other. She never, ever disappointed me. She gave me comfort, trust, and had a huge personality. Towards the end of a long day – 500 miles was typical. But I must confess that I abused that trust. At around 14,000km, a message on the dash said ‘oil service’ but I didn’t have time and there were no workshops. If I could have found any oil, it would have been poor quality. The bike did almost 12,000km without an oil change! But there was little other maintenance – I added just 200ml of oil over the whole ride, adjusted the chain once and changed the rear tyre. That’s all. So thank you Multistrada, and thank you Ducati for this unforgettable experience. Multi-national Ducati fans celebrate with Vira Nakai, who rode the first stint, Bologna to Moscow. It is the end of my beautiful trip: 7457 miles in 19 days. A quarter of the way round the earth. Landscapes, people, adventure. Ducati wanted to celebrate its 90th anniversary and came up with the idea of sending a Multistrada 1200 Enduro around the world -19,000 miles in four months. Seven riders were picked to ride seven different stages, each doing a stint of around 20 days. 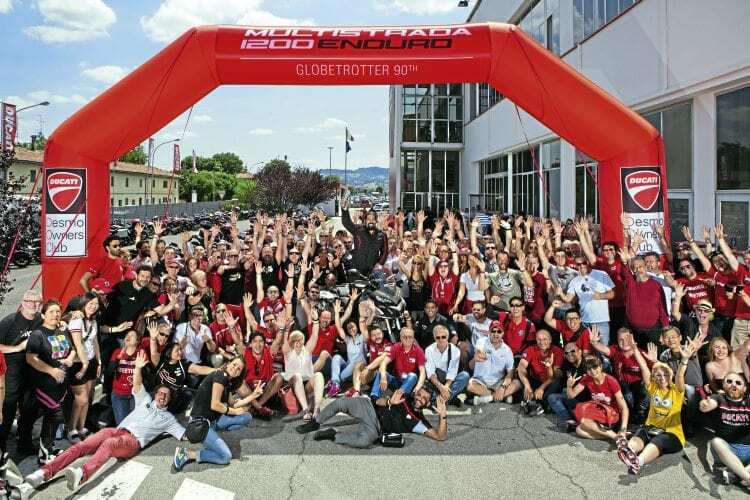 More than 3000 people applied for the chance to ride a brand new Ducati through exotic locations, a number that was whittled down to a final 14. They were taken to a special ‘boot camp’ in Tuscany to assess riding skills and psychological suitability, and seven of them weeded out. The final seven comprised six men and one woman: Indian, French, Belgian, Brazilian, Australian, British and German.